We all know that successful innovation is not easy to achieve. And still, we sometimes seem to hope that the 1% inspiration is more important than the 99% transpiration. Well, it’s not. Even though the four initial building blocks (problem, idea, developing, implementing) are comparatively simple, the multitude of interactions between them generates considerable complexity. The demand for and generation of useful knowledge increase this complexity even further. Inspiration, representing only 1% of the overall effort, occurs in the tiny little sweet spot between problem, idea, and development. All the rest requires transpiration to succeed. While there could be a straightline flow from problem and idea through development to implementation, numerous feedback loops will cause iterations. 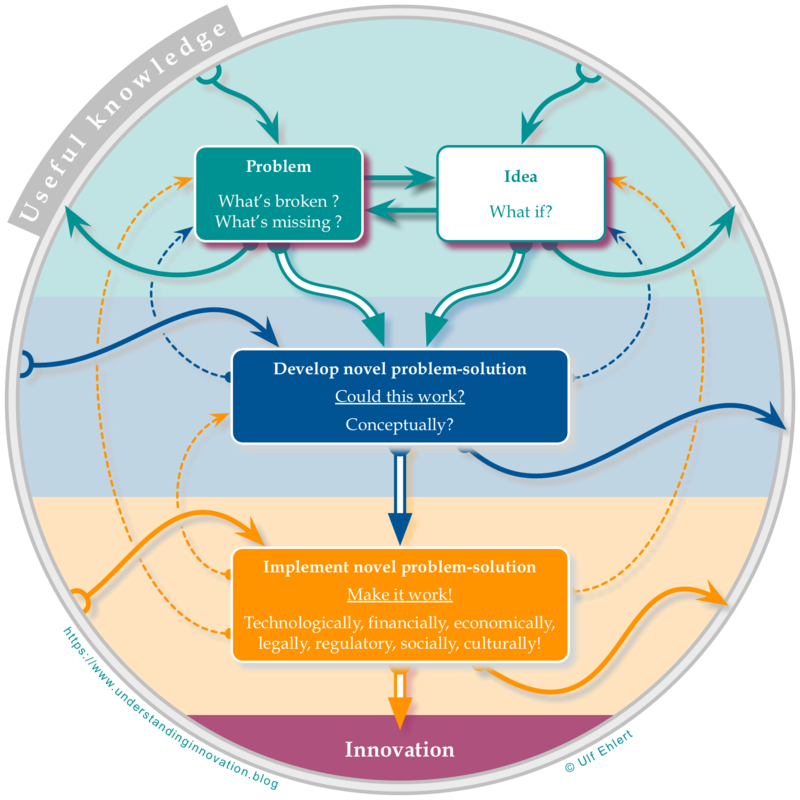 However, they allow for a diversity of possible start points, and for different paths to take towards developing and implementing a novel problem-solution, towards successfully delivering an innovation. Of course this sketch is just another attempt at creating a graphical representation of the inner workings of innovation. There’s still a lot to explore, and I am myself detecting new ways of reading this chart every time I look at it. I’ll share those ideas as they mature further. Great graphic representation of the innovation generation process. Just a thought regarding the outer circle of “useful knowledge” at the first conceptual stage of problem identification and idea (what if). When knowledge is used as input, it is still knowledge, but maybe not necessary “useful” yet. At the beginning any kind of knowledge is used as trigger for something innovative. In the new interconnected world that we live, even the most irrelevant knowledge can be proven useful at the later stage of development and implementation of the novel solution. An expert for instance in ornithology is studying the characteristics of the hummingbird when hovering. This is not “useful” information for an aeronautical engineer, unless he or she thinks of it as an inspiration of a new way of flying. A lot of knowledge has been used to innovative ideas that failed at the end. For the one that succeeded, the knowledge used, is proven to be “useful”. Thanks for the feedback. And yes, I’d fully agree: there is no way to know a priori whether the available knowledge is going to useful or not. Rather, utility can only be assessed a posteriori. And that means that we should never reject ‘a piece of knowledge’ prematurely. On the other hand, more access to ever more knowledge is not the ideal solution either, because it still needs to be filtered, tested, and assessed for its potential utility. That’s the big dilemma: too little access to knowledge will slow innovation, but too much will do the same. Still need to think about how we could define a sweet spot. More to follow.